The provision of real-time information concerning bus arrival times could potentially reduce the uncertainty associated with public transport trips and improve the overall level of service. In addition, real-time predictions might enable operators to apply proactive control strategies. Sollae Systems’ embedded RS232 Ethernet converter can be applied in the bus information system, specifically a sign board controller. Sollae Systems' RS232 to Ethernet converter can be applied to the bus information system which shows bus arrival time, bus number from the data collected by BIT, Bus Information Terminal, through VPN or Internet network. It is very convenient for the passengers who are enabled to easily search the information on the Internet beforehands in real time. 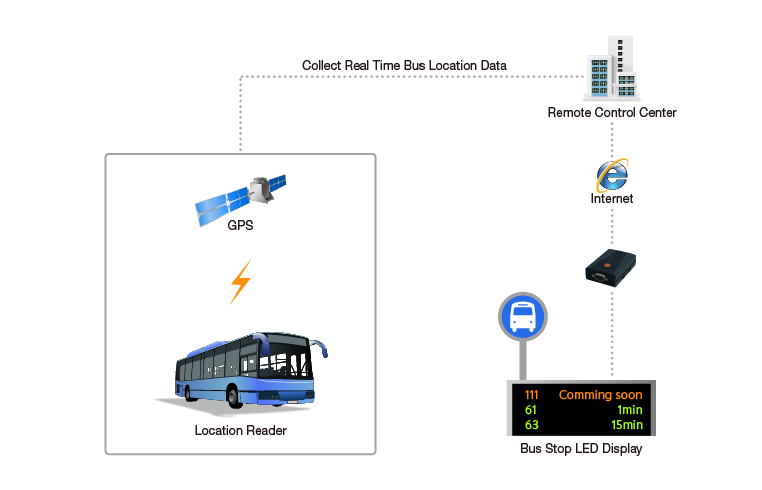 Information data such as bus operation management data and running period management data is transmitted from location reader installed inside of the bus to the remote-control center to track the position of buses and check the traffic condition.